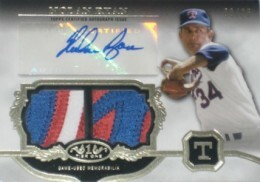 Topps Tier One is all about the hits and the deep checklist of former greats and current stars. 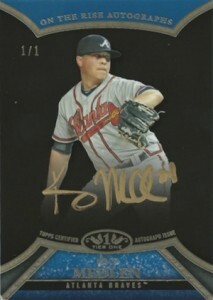 2013 Topps Tier One Baseball continues the popular trend. Much to the disappointment of many collectors, the product does contain many more redemption cards than expected this year, but the cards are selling well and the live versions look good. 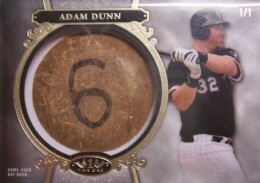 Just like 2012 Topps Tier One Baseball, the top values are found with the one-of-one Bat Knobs for Hall of Fame players. 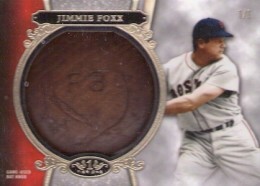 Former great, Jimmie Foxx, has already been pulled and headlines the list. 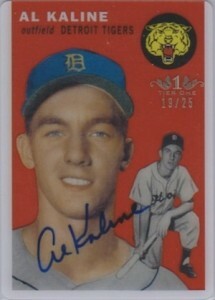 Outside of those incredibly rare cards, the most popular option is the Clear Rookie Reprint Autographs. The acetate cards take a nostalgic look back at the rookie seasons of top MLB players and add an autograph for good measure. With a print run of just 25, Buster Posey and Al Kaline appear to be the top live cards, and the Clear Reprint Autograph redemption for Hank Aaron takes four of the top ten spots. Other standouts include the Autographed Prodigious Patches redemption for Clayton Kershaw, as well as and Dual and Triple Autographs. Popular pairings include Sandy Koufax with Hank Aaron and Cal Ripken Jr. with Manny Machado and Adam Jones. 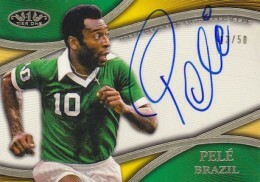 Lastly, soccer legend, Pele, makes another appearance in a 2013 Topps product and he is still drumming up considerable interest. Rounding out the list, what would a baseball product be without a few Bryce Harper cards? The following is a real-time look at the most-watched 2013 Topps Tier One Baseball cards currently listed on eBay. It's constantly updating so if you're tracking this release, be sure to bookmark or check back regularly. 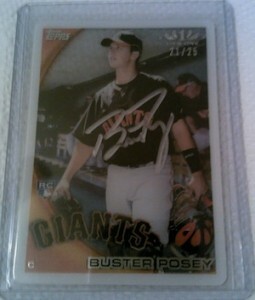 Click on the tab above to see a list of the top 20 2013 Topps Tier One Baseball eBay sales recorded from the set's release through August 29, 2013. The following is a list of the top-selling 2013 Topps Tier One Baseball singles sold on eBay through August 29, 2013. Any idea the value and interest for my 2013 david ortiz tier one prodigious patch card? 2013 Topps Tier One HOBBY Box Pack 2 Auto 1 Relics Machado Puig RC Koufax Aaron?